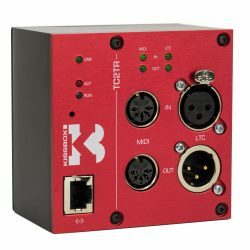 The CM-MIDI2 integrates both the powerful RTP-Midi implementation of Kissbox’ MIDI2TR professional transceiver, and the USB-Midi communication standard encountered on many musical products. 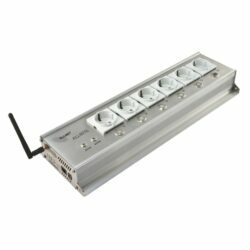 The CM-MIDI2 is ideal for musical applications where high speed communication between USB and Ethernet RTP-Midi is needed. 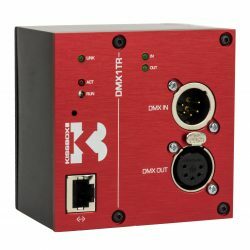 The CM-MIDI2 acts as a gateway between the three available Midi interfaces, any Midi stream fed into one interface can be re- distributed to any of the two other interfaces. For example, Midi received on Midi IN DIN connector can be sent both to Ethernet RTP-Midi and USB. The USB interface of the CM-MIDI2 is fully « class-compliant » and it is recognised as a standard Midi interface by Mac OS, Windows and even by iOS products ( iPhone, iPad, iPod ). Compared to other USB-Midi interfaces, the CM-MIDI2 fully unleashes the communication bandwidth between devices, since RTP-Midi offers 300x more bandwidth than Midi 1.0 interfaces. And of course, the CM-MIDI2 can be controlled directly by any other Ethernet RTP-Midi device, like a master keyboard or DAW controller, without the need of involving a computer in the network path.